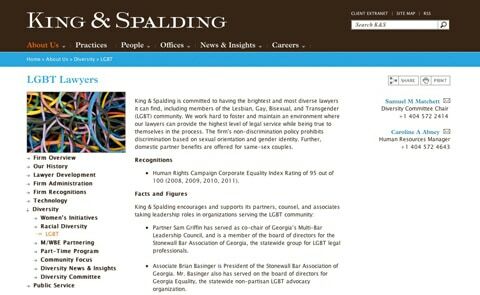 Administrators at some of Washington, D.C.'s top law schools said it is too early to tell whether King & Spalding's role in defending DOMA will sour students from potentially joining the firm; they also couldn't say whether anything could change with their university's recruitment practices. But they did say they take the concerns voiced by their student bodies very seriously. Tedi Mason, the recruitment coordinator for American University’s Washington School of Law, said the school's gay and lesbian student group Lambda Law Society is “very active” on campus and if brought complaints, the administration "would certainly consider” what they had to say. She predicted protests and student groups “putting up a big to-do” if and when the firm comes to the campus to recruit students. Lambda Legal legal director Jon Davidson says they won't be involved with the firm any longer: "As legal director, I would take the position that we should not use them as cooperating attorneys with us — that is, people who work with us on a pro bono basis in cases. "I wouldn't want to team with them, so long as they're actively harming our community by defending DOMA."